This past weekend I got to watch two of my friends compete in a Triathlon – I even woke up at 5 am to go. I consider that full commitment seeing as how I don’t even wake up that early for work (thankfully). It turned out to be a great morning for the event, it was sunny and warm with few clouds in the sky – perfect for the runners/bikers after their indoor swimming and for the spectators watching. After the triathlon we got home about 1:00 and I felt like I could either fall asleep or begin doing something since I was surprised I was still standing after the 5 am wakeup. Then I realized that if the athletes could wake up and do 24 laps in the pool plus a 25 K bike ride followed by a 5k run, I could probably muster up the energy to stay awake. So I did – and I decided it would be the best time to continue with the ‘spring cleaning’ around the house. I continued into the kitchen, sweeping through the cupboards and drawers and getting rid of anything and everything I did not absolutely need/use. I had so many doubles of everything, things I’ve never even used, things I thought I would need but don’t etc. It felt great to get rid of it all – and our cupboards have never looked so clean and organized. I’ve already brought about 3 big loads to the thrift store this past month (including other clothes/household items) and now I have one more to go. I bring it to the hospice thrift store so I know the money they make goes back to a good cause. After cleaning up I had a rest on the couch almost falling asleep, but not. Then at around 5:30 I felt like I had better go do something active after watching everyone compete and feeling like jumping in at the race too. I did a 25 minute run followed by a 15 minute walk for a roughly 5K route. I just downloaded the APP – Map My Run that I’m excited to use and plan runs around the neighbourhood. I’ve run around here before obviously, but I’ve never tracked it. It’s fun to see where you’ve been and how long it was. My neighbour and I have also recently made good use of the infrared sauna in our clubhouse after our workouts – the best. After the triathlon we went out for brunch so the athletes could refuel. 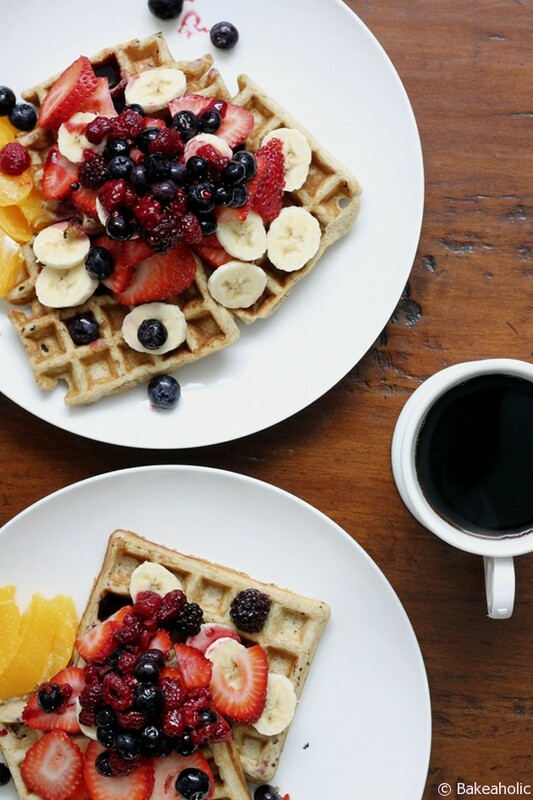 If you’re into brunch, or big breakfasts, I suggest making your own waffles at home including these wheat-free, sugar-free Quinoa Flour Waffles that I had seen online. They’re light, fluffy and crispy and you can easily double the recipe for larger crowds. They would be a great re-fuel breakfast, or a breakfast to get your up and on the go for the day. Crispy, light quinoa waffles that are sugar free, wheat free and delicious. Top with fresh fruit. Preheat waffle iron and spray with coconut oil/nonstick cooking spray. In a large bowl, whisk together quinoa flour, cinnamon, nutmeg, and baking powder; set aside. In a separate large bowl, combine banana, egg whites, vanilla extract, and almond milk and beat until well combined. Mix in dry ingredients until well combined with handheld beater/blender or whisk by hand. Spoon 1/4 cup of the batter into waffle iron and cook about 3-4 minutes (depending on your waffle maker) waffles are golden brown and slightly crispy on the outside. Repeat with remaining batter. Recipes makes about 4-6 waffles - can easily be doubled for a larger crowd. Beautiful pictures!! 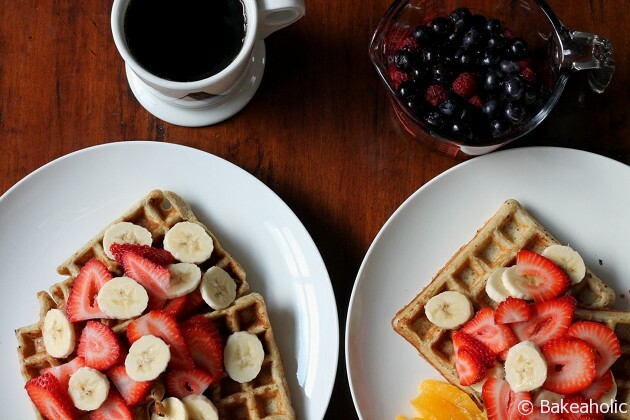 I can’t wait to make these waffles this weekend. Thanks for sharing and congratulations to your two friends-and to you, for waking up at 5am and skipping a nap!! Thanks!! Hope they worked out!